Dates up there, me down here: a very Biskra problem. 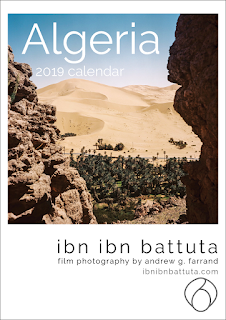 Biskra sits at the cusp of the Sahara, where Algeria's rich band of verdant green gives way, in a craggy fit of canyons, to the vast southern desert. 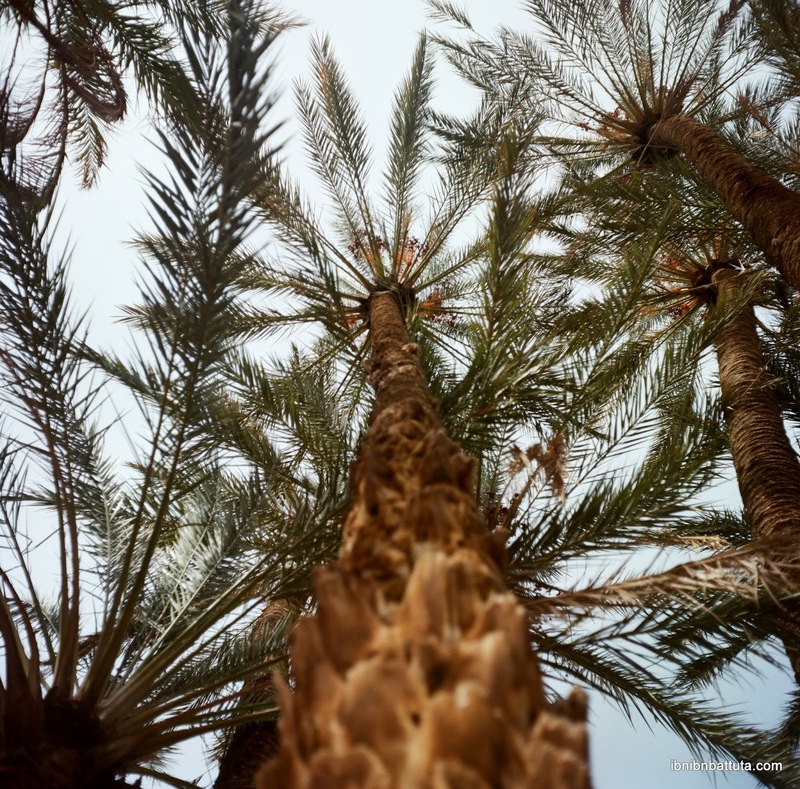 Besides its rugged scenery, Biskra's spicy local culinary specialties (chekhchoukha, zfiti, and others) are also legendary, and the region is renowned as the source of Algeria's best dates, the deglet nour. Biskra was also the target of many anti-colonial uprisings over the years. And it was on a remote mountain road east of the city, on November 1, 1954, that the FLN launched the fumbling attack that would herald the start of Algeria's war for independence. Over a few days of meetings in the city, I had only limited time to explore. But Djazil and Tarik, two colleagues from Biskra, helped me make the most of it. We visited all the town's traditional restaurants, got tea at their favorite spot in the old town, and toured the few attractions of note in the city center. Few of the once-luxurious colonial-era hotels remain; new construction is transforming the city. 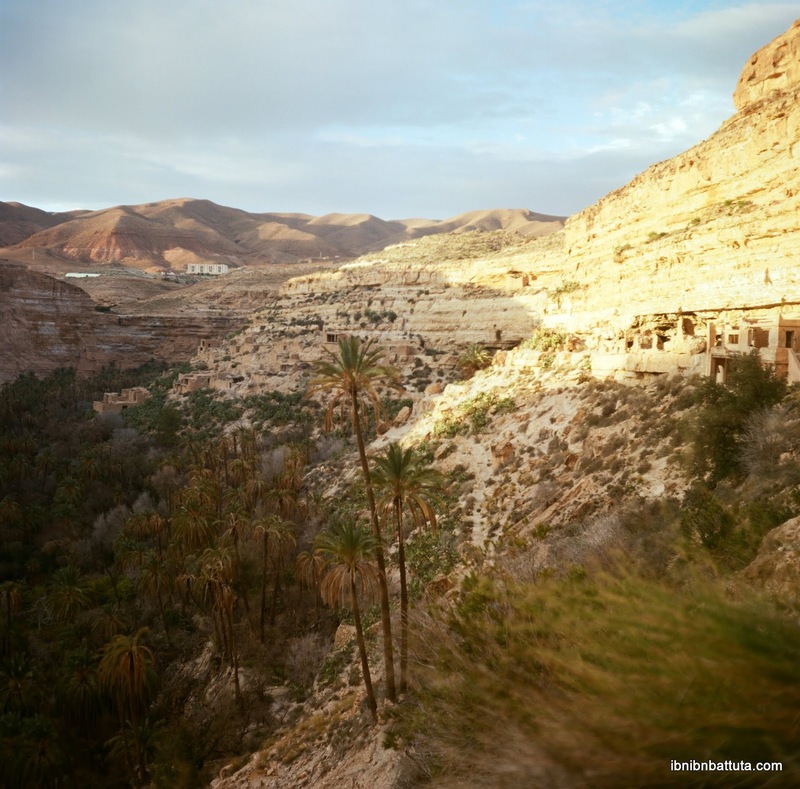 Where before it just hugged one bank, Biskra now spans both sides of a wide, rocky riverbed, in the middle of which sits a white domed building—the mausoleum of Sidi Zarzour. The riverbed is almost always dry, but even when it swells with rain, my guides proudly told me, the waters spare the saint's shrine. When the weekend arrived, I took a day with Djazil and Tarik (and the latter's young daughter) for a day trip to some of the area's best sights. Just outside the city, we visited another mausoleum, that of Okba Ben Nafaa, the early Muslim conqueror who carried Islam from Egypt clear across North Africa to Morocco's Atlantic coast in the late seventh century, only to perish, during his return, in an ambush laid by the local Berber king Aksel and his Byzantine allies outside Biskra (then known by its Romanized name, Vescera). While local pride in the early Berber leaders still runs strong, with the passage of centuries residents have come to embrace Sidi Okba as a saint, if not a founding father of the region. Time heals all wounds, it seems. 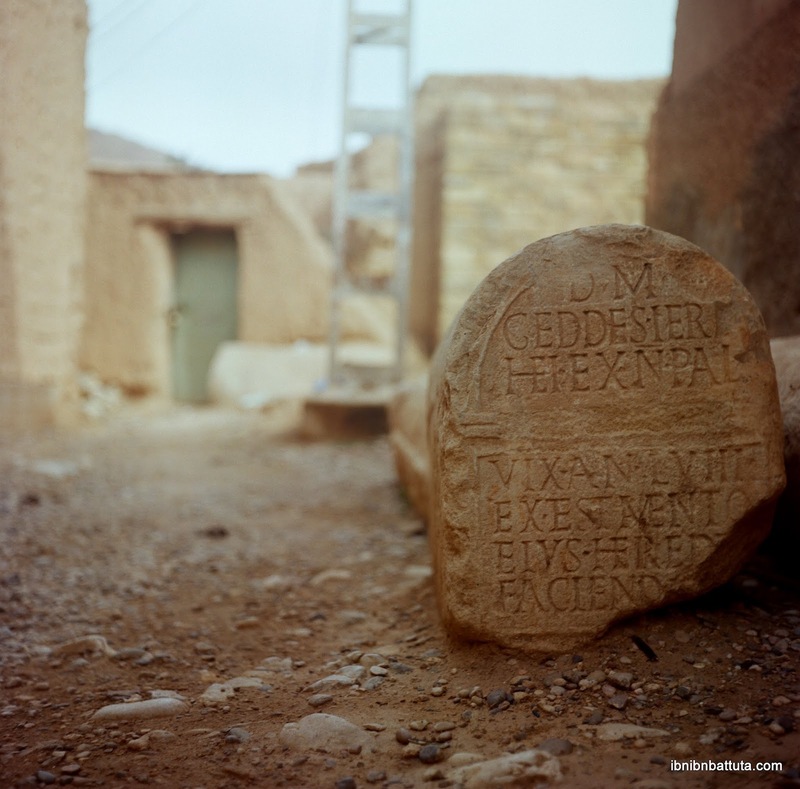 Roman remnants decorate a ksour near El Kantara, north of Biskra city. Heading north, we drove into the foothills of the Aures Mountains to El Kantara ("bridge" in Arabic). The town sits below a nook in a ridge, where a Roman-built stone bridge still stands today, marked with an inscription from Napoleon III, whose troops repaired it in the 1860s. Roman columns and stellae still dot the nearby palmeraie. That afternoon we traversed the M'chouneche oasis and again climbed into the mountains, reaching the Balcons de Ghoufi a few hours before sunset. Here the Oued Abiod river winds deep within a massive, snaking canyon (though owing to the gorge's horizontal bands of red-and-yellow rock, it has long been called the "balconies" of Ghoufi rather than the "canyon"). Wedged into one of these bands, on the far side of the gorge, we spotted the ruins of one of France's most audacious colonial constructions: the once-majestic Hotel Transatlantique, which the French had carved into the cliff face in the first years of the 20th century before abandoning it a few decades later (after it was damaged by FLN strikes in the independence struggle, according to some accounts). 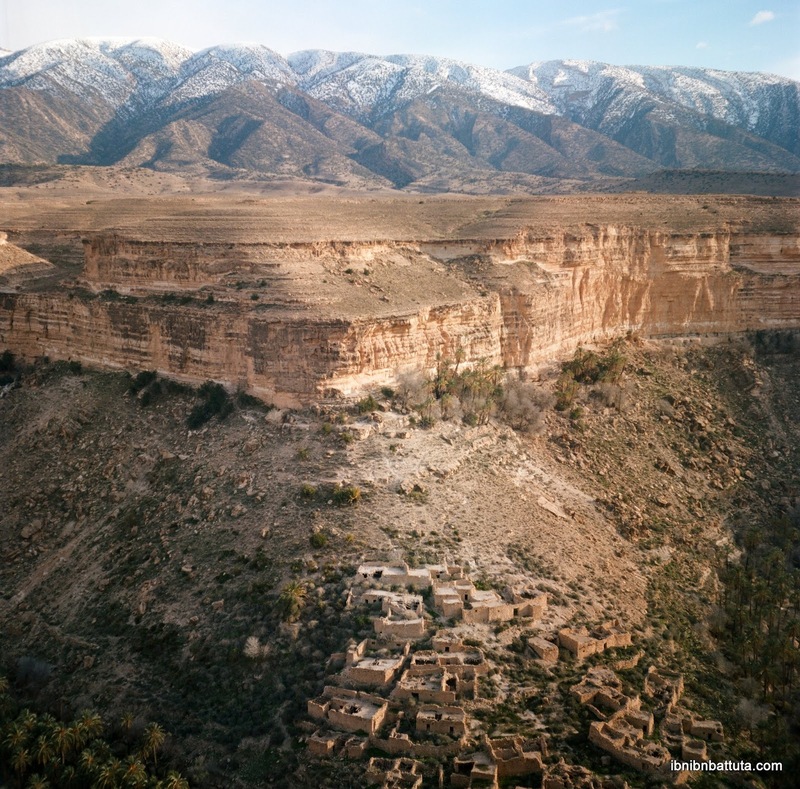 Their choice of site was neither entirely crazy nor at all original: the area's Berber inhabitants had been building among the cliffs for centuries. Today, there is some occasional chatter about rebuilding the hotel, though I'm not holding my breath. At right, the ruins of the Hotel Transatlantique catch the late afternoon sun. After four days in Biskra, I was growing increasingly worried that I hadn't yet paid for a single one of our meals, but Djazil and Tarik wouldn't hear of it. Such is the generosity of people here that I went my entire stay without buying so much as a coffee. The downside of the trip, however, was the secret police detail shadowing us constantly. As a foreigner working with civil society in Algeria, I'm no longer surprised when the government here treats me with suspicion, but I had never encountered such overzealous surveillance. These officers got my companions' phone numbers, called them continuously to ask where we were headed next, and freaked out the one time I managed to slip them by ducking out of the hotel early one morning. In Algeria, I've learned to save my energy for the things I can control. The secret police is not one of them. So I just shook my head and laughed at the absurdity of it when, by the second day, the two plainclothes were eating every meal with us, chatting away at the same table. 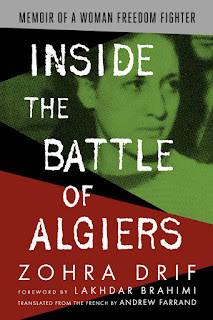 (One of them even recommended I watch the latest anti-government video circulating among young Algerians on Facebook.) When I left town, I thanked Djazil and Tarik profusely for their generosity, and gave them each a calendar. Then I gave one to each of the officers, and was on my way. 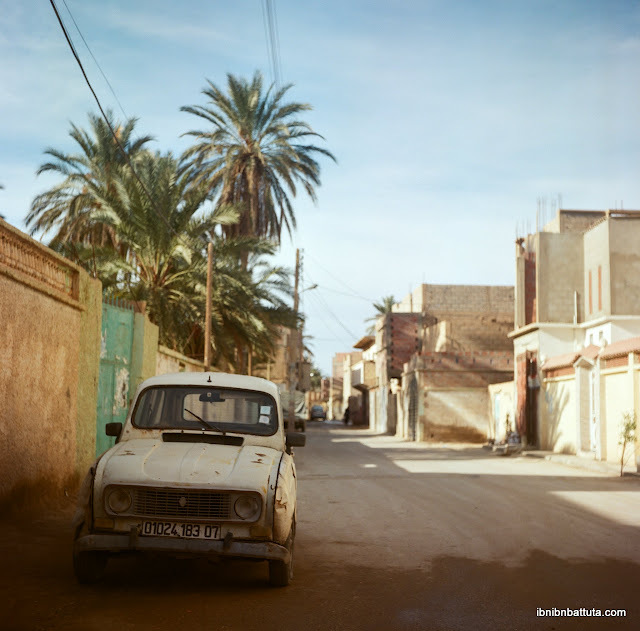 If you enjoyed my Rolleicord photos above, click here to see the full album from my trip to Biskra. The balcons de Ghoufi looks like the Grand Canyon back in the US,no? I really miss biskra I used to visit it 3 to 4 times a year since my mom is from there but when my grandma died 5 years ago i had no reason to go but i really all my friends and relatives:'(:'( . Appreciate your posts Andrew! Keep up the great work! 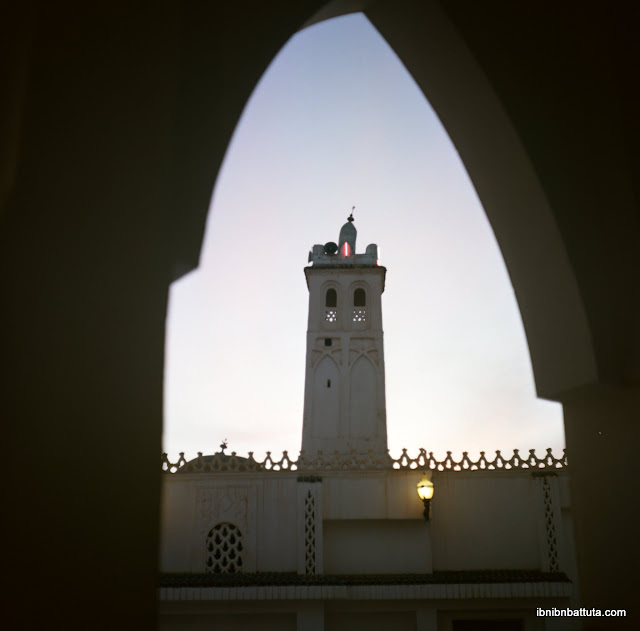 I'm from Biskra, and I was very honored to hear such a nice words about my city coming from you. 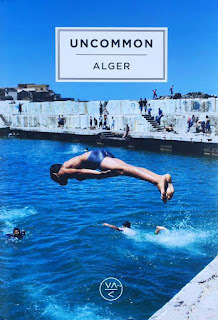 J'ai lu quelque part une citation qui disait ' la solitude est un mensonge l'univers m'accompagne ' moi je dirai 'la solitude est un mensonge l'Algérie m'accompagne ' ..
Je sais pas si je dois commenter sur le coup ou attendre à lire d'autre textos.. mais en faite parfois on ne peux s'empêcher de commenter .. de dire des mots qu'on croyait jamais devoir dire ..
Je reviendrai pour commenter d'autre texto prsq à ce moment je ne px que me laisser emporter avec cette sensation.